According to the Baltimore Sun, former reliever Todd Williams may become an Oriole again. Sam Perlozzo went to visit him in Florida where he lives and is reported the team has made progress in attempting to re-sign him. Roch Kubatko of the Sun reports that we signed Bubba Trammell at Christmas time. The O’s have sure been aggressive in the free agent market and perhaps the moves will help to make the team competitive in 2007. Congrats to the Baltimore Ravens for earning a playoff spot and getting a bye with a win over Buffalo 19-7! The 'Skins are my team (I will refrain from comment), but I'll be watching the Ravens closely and perhaps they'll make the Super Bowl. The media, especially the cable sports networks are not giving them any love, but hopefully the play of the team can take care of that. Fan Fest Update: I completely missed this until this morning, but a poster sent me the link the Oriole Fan Fest. Keep in mind YOU still cannot find the link on the Orioles.com homepage. Intentional or not, I don't know, but it would be nice if it was mentioned on the opening page. Current, former and future Orioles players and coaches will participate in Orioles FanFest 2007, scheduled for Sunday, January 14 at the Baltimore Convention Center. Players and coaches will sign autographs, pose for photos and participate in fan forums at the event. Tickets for FanFest are $10 for adults and $5 for children 14 and under and those over 55. Tickets are also available at the Orioles offices, by calling the Orioles at 1-888-848-BIRD and at the Orioles team stores in York, PA and Washington, DC. On the day of the event, FanFest tickets will be sold at the Convention Center and the Orioles Box Office. Free parking for all fans is available in Lot B/C. Orioles FanFest is not meant to serve primarily as an autograph show, but rather as an enjoyable celebration of the start of the Baseball Season. We invite you to enjoy all of the FanFest elements, including interactive games, displays, sponsor booths, clinics and fan forums. Thank you for joining us today and hope you enjoy everything Orioles FanFest has to offer. 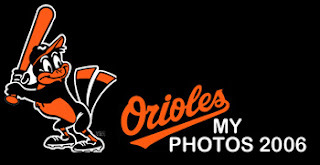 * The Baltimore Orioles have their 2006 Year in Review on their website called "Youthful Birds Make Strides". A nice little read, and looking at it right now, you can easily conclude the team for next year is far better than the one that played their last game a few months ago. * The New York Yankees' possible trade of Randy Johnson to the Arizona Diamondbacks has hit a roadblock. According to the New York Daily News, the deal has slowed down due to issues with possible restructuring of Randy Johnson's contract. The problem is that the Diamondbacks already owe him about $40 million in deferred money and are trying to work it into a deal. As well, Randy Johnson would like an extension on his current deal & the Diamondbacks are trying to get Yankees to eat some of the contract. In turn, the Yankees would like young talent in return for their minor league system. * New York Mets pitcher Pedro Martinez is also recovering well from surgery on his rotator cuff, but he will not be expected to pitch until July or August. * From mlb.com, "Free agent left-hander Mark Mulder, who is recovering from rotator cuff surgery on his pitching shoulder, has narrowed his field of bidders to the Cardinals, Indians and Rangers, his agent told the Cleveland Plain Dealer on Friday." * Jeff Suppan passed a physical Friday morning and his deal with the Brewers is now official. He is slated to receive 42 million over 4 years. This evening, rather than watch some football on TV, head out to the Skins’ game or partake in bar activities, I decided to venture into Washington D.C. and view Gerald Ford’s casket on display at the rotunda of the U.S. Capitol. I’d seen the viewing for Rosa Parks in 2005 at the same location, and the procession for the 40th president, Ronald Reagan. Well, I waited about two hours in line to see the casket of Gerald Ford and you were in and out in about a minute, if even that. The good thing was that people from every race, group and class of society seemed to be out there and everyone had a lot to say about Gerald Ford and the occasion. The time seemed to pass by, as I was with a group of people and we chatted about everything from politics to sports. His body lay in state in the rotunda, with members of every branch of the armed services remaining perfectly still around his casket, police directed you where to go, you moved in a line and it was pretty much over. It was amazingly organized and there was an incredible amount of security. If you do plan to go out there, expect a long wait, with a littany of rules and regulations. Myself, I am a big history buff and living in the Washington-Baltimore area, you see a lot go on in this part of the country that would you not see otherwise. Having the opportunity to see Gerald Ford’s casket and being part of the occasion is a once in a lifetime thing, so I am glad I took out a part of my evening to do so. I’ll see if I can get some pictures posted in the morning, or maybe Monday, since I’ll be in and out all of Sunday. Saddam Hussein is dead. Good riddance. In the end, evil never gets a reward. According to the Baltimore Sun, the Orioles have reached an agreement with Aubrey Huff. The deal is estimated to be for 3 years and 20 million dollars. As you know, Huff had been targeted by the Orioles for his versatility, but for his bat as well. The Orioles have spent much of the off-season looking for a big bat; Huff may fit the bill if he can match his production before 2006. If he is the deal, then the Orioles have gotten an impact bat at a bargain price. However, he's not known for his glove and if he's in his regression phase, then the team might have made a bad move. All now that’s needed is for him to pass his physical and the deal is official. * Still needing an impact bat, the Baltimore sun reports that the Orioles have made an offer to Aubrey Huff. Huff is asking for a three-year deal worth around $7.5 million per season, but according to the report, the offer is not that high. He can play left field, right field, first and third base, which would make him a great platoon option and also give him the ability to be in the lineup almost daily. Although he had a down year in 2006, his power along with his ability to drive in runs would be perfect for the Orioles’ needs. The Los Angeles Angels, Texas Rangers and Pittsburgh Pirates also other teams mentioned who are in play to sign Huff. * In the same article, the team has had some conversation with the agent for first baseman-outfielder Craig Wilson, but also, the two sides have not had much discussion the past couple of days. *The Orioles are trying to avoid arbitration with Daniel Cabrera by offering him a one year deal. Other players who are also arbitration-eligible are Brian Roberts, Erik Bedard, Corey Patterson and Rodrigo Lopez. Reflections on "We Are Marshall"
Ok, I just got home from ‘We Are Marshall’. I went on a recommendation of a friend in the Pittsburgh area and while I was planning to see the movie anyway, but her assessment of it urged me to go. I saw the movie and I walked away a little disappointed. Now ‘We Are Marshall’ was not a bad movie, but for an event based on such a horrific tragedy, it felt like watching a Disney movie. Well, I’m sure the movie must have been cathartic for the citizens of Huntington, WV, but for me there was something just not right about it. There did not see to be much flow, and the whole seemed to be disjointed and full of clichés. It’s hard to really dismiss the movie since it’s based on a tragedy; however, it seemed very empty, I was not swayed by it and the focus of the story was not there. You don’t seem to learn about the people involved, and that’s mostly why I feel the movie didn’t reach its potential. The only character who had any depth was Matthew Fox as Red Dawson, the assistance coach. Matthew McConaughey tried his best as the head coach, Jack Lengyel, but instead of focusing on the tragedy, he focuses on building a team which completely misses the boat and sort of cheapens the movie. Sorry to be so negative, but ‘We Are Marshall” came off lacking in what I needed to be satisfied with it. My beloved Terps beat Purdue in the Champs Sports Bowl, 24-7. For those of you who went to Maryland, to feel about about yourselves, here's a link to the fight songs! The Baltimore Sun's trusty reporter and blogger, Roch Kubatko updates us on former Oriole David Newhan. It looks like may sign on with someone for a minor league contract and the choices are between the Cubs and Mets. Newhan could do a lot worse than those teams, and I wish him the best of luck. He was always one of my favorite Oriole players & a bench guy, he always played hard and often paid for it with his body. He was always nice to me when I wanted something signed like an autograph or just quick conversation. According to the AP, The Florida Marlins and infielder Aaron Boone agreed to a $925,000, one-year contract on Friday, a move that gives one of baseball's youngest clubhouses another veteran and additional depth. Right now, I am at a Kinko's near the Washington D.C./Maryland line right now, readying to see the movie, "We are Marshall", since it doesn't start for another hour & I needed to kill time. A good lady friend in the Pittsburgh area saw the movie already, & was highly recommended by her to see. I have already seen the "Pursuit of Happyness" this week, and it's rare I see 3 movies in a 2 week span. I'll let you all know what I think when I get home. * Daniel Cabrera’s Gem at Yankee Stadium: In late September, Daniel Cabrera lost a no-hitter with two outs in the 9th inning in a game at Yankee Stadium. Cabrera who was electric that night lost his no matter to countryman, Robinson Cano who plays second base for the New York Yankees. This game was a watershed moment for Daniel as he struggled throughout the year and had a stint in the minors. The Orioles won that game 7-1 and it perhaps raised the profile of Daniel even higher within the organization. It’s yet to seen if he can translate the success of the no-hitter into 2007 and take his game to another level. * Nick Markakis hits three homeruns in one game. Oriole Rookie, Nick Markakis who had been hot from June into September when he has historic game where he hit 3 homeruns in one game. On August 22, Nick went 3-4 for with 3 RBI and runs scored. * Tejada Breaks Orioles’ Hit Record: On September 29th, shortstop Miguel Tejada singled in the second inning to set an Orioles record with his 212th hit, one more than Cal Ripken Jr. had in his MVP season of 1983. * The Baltimore Orioles and Washington Nationals played each for the first time in interleague play on at RFK Stadium in Washington D.C. in May in what would be “Dubbed Battle of the Beltway”. The Orioles would lose 2 out of 3 and the two teams would meet in Late June. * The Protest. Over 1,000 to 2,000 fans walked out en masse from Camden Yards during a game in late September versus the Detroit Tigers. Arranged by radio station WNST and owner, Nestor Aparacio, the goal of the protest to was to get Peter Angelos to sell the team and make him aware how angry fans were at the state of the team. Although the team was not sold, the protest got the attention of local and national press. * Miguel Tejada breaks an Orioles’ record for hits in April with 40. * The Orioles’ come from behind win on May 14th. In a dramatic game, Kevin Millar singles and Javy Lopez scores the winning run, as the Orioles beat the Royals in the 9th Inning. * Daniel Cabrera strikes out 10 on August 19th, and throws a 5 hit shut-0ut against the Toronto Blue Jays. * Ramon Hernandez hits a walk-off homerun on April 15th to win a game against the Angels. 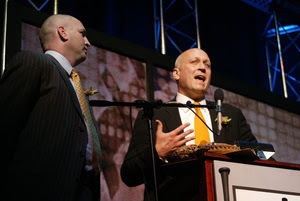 The Cal Ripken, Sr. Foundation’s one of a kind annual gala, Aspire: A Tribute to Life’s Coaches, will be celebrated on January 26, 2007. Each year, this heartwarming evening event provides a select group of honorees from the fields of entertainment, business, and sports the opportunity to honor the people in their lives who inspired and helped guide them to success. The 2007 Aspire gala will be a very special event! It will be the first year of Hall of Fame eligibility for both Cal Ripken, Jr. and Tony Gwynn, both of whom will be present at Aspire. Many Hall of Famers have been invited, and the weekend celebration is expected to be the largest gathering of Hall of Famers outside of Cooperstown in recent memory! John Walsh, host of America’s Most Wanted, will be honoring his life coach and some of the Hall of Famers to be in attendance include Johnny Bench, Rod Carew, Steve Carlton, Orlando Cepeda, Paul Molitor, Jim Palmer, Gaylord Perry, Robin Roberts, Frank Robinson, Tom Seaver and Earl Weaver. This year’s Aspire promises to be one of the most talked-about events in Baltimore. Mark your calendars now and for information on sponsorship opportunities, please contact Steve Salem, Executive Director, or Lindsay Rinker, Special Events Manager, at the Cal Ripken, Sr. Foundation at 1-877-RIPKEN1. Single tickets will not be available for this year’s Aspire but many of the players will also be part of the “Baseball’s Best” weekend celebration at the Baltimore Convention Center. Daily admission for the memorabilia show by Ironclad Authentics and MAB Celebrity Services is only $10. The weekend festivities will also feature the Ripken Coaching Experience: An Interactive Coaching Clinic hosted by Ripken Baseball. Morphy Auctions, a division of Steve Geppi’s Diamond International Galleries LLC, will be onsite at Baseball's Best to promote and accept consignment pieces for the upcoming Ironclad / Morphy’s Auction scheduled to conclude March 24-25. The auction will feature Hall of Fame memorabilia and will be conducted as an absentee and Internet auction with a portion of the proceeds benefiting the Cal Ripken, Sr. Foundation. This is all part of the Baseball's Best Weekend. Also, Saturday, January 27th Baltimore, MDSpecial guests Jim Palmer, Don Mattingly and more are on hand for this interactive coaching clinic. Participants will rotate through 3 break-out sessions with the pros covering Hitting, Pitching and Fielding. Time : 2pm - 6pmCost: $149 per person*This exceptional event coincides with "Baseball's Best" to be held at the Baltimore Convention Center - an unforgettable sports collectible and memorabilia event featuring several current and former baseball greats. Coaching Clinic participants will receive free Saturday admission (event starts at 9am) to this Ironclad Authentics event of the year! 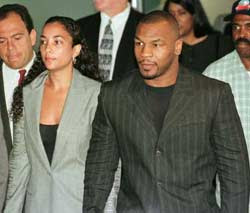 Mike Tyson, so much talent as a boxer, became rich, then beyond hope. He was once probably the most menacing man on the planet, and now in middle age, a sad case of a life wasted. Mike Tyson faces serious drug charges after being arrested in Buckeye, Arizona with two bags of white powder that he said was cocaine. According to the police, he said he was "an addict and had a problem." For everything, he seems to be man with a good amount of intelligence, but he's also got severe mental problems. I saw the Buster Douglas Fight with my uncle on TV when I was 10 where he got knocked out and his legend died. He predicted at the time Tyson was done. He was right. If he's indeed sick, he needs help and to be away from society for a while. At this point, he may be too far gone. What a tragedy. The O's hopes to sign outfielder Shannon Stewart to a contract that will probably be full of incentives due to his injury history, lately his foot. Although the Giants signed Barry Zito to a monstrosity of a contract, CNNsi's Jacob Luft thinks the Giants will still finish in fourth in the NL West next year. I whole-heartedly agree with him, as they just replaced Zito with Schmidt and isn't that much of a difference. San Diego and San Francisco are looking at David Wells. He's looking at a a $3 million guarantee, and while he said he's retire after the season, that does not look to be the case now. Cleveland looked like it would sign reliever Keith Foulke, but being they have not and Boston needs the bullpen help, they might take a chance and re-sign him. 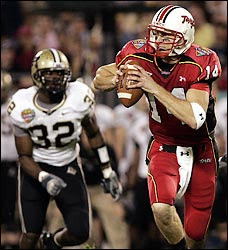 Non Baseball-Related: My beloved Terps under the tuteledge of coach Ralph Freidgen aka "The Fridge" play tonight in the 'Champs Sports Bowl' against Purdue. We are back in a bowl after 2 sub-par seasons, and the Washington Post has a great article about him, the struggle to win again and his role as being the head of a major football program. Bobby Knight missed taking the Men's Division I all time win record last night for himself. He and his team play in New Mexico on New Year's Day. According to the AP, Major League Baseball's Players' Association will fight a federal appeals court's decision to give prosecutors access to the names and urine samples of about 100 players who tested positive for steroids in 2003. Major League Baseball and the Union, headed by Donald Fehr says the recent ruling violates the 4th Amendment, which protects one from unreasonable searches and seizures. He asserts that making the test results public would invade the privacy of players, who are under the assumption that the results were sealed. Fehr and MLB are still in the opening stages of fighting the decision. Bobby Knight goes for the all-time win record in Men's Division I college basketball tonight at UNLV in Lubbock, TX where his Texas Tech teams plays UNLV. Right now, he's tied with Dean Smith for the all-time win record. Tennessee's Pat Summit holds the all-time college basketball wins record. The video above is courtesy of CSTV. I’m sitting around at work doing nothing on a Thursday in between the holidays, so that being said, I might as well be productive. Well, I am going to take a look at moves and signings in my opinion that have been the 10 worst. Right now, we have about a little more than 2 months left before spring training and it’s a good time to review. I may look back next week, next month, three months, or a year from now and decide, hey I was wrong. *Gil Meche. Ok, he receives a 5 year deal for 55 million. Can I ask why? Is he worth 11 million annually? He’s been oft injured and has not lived up to expectations although many in people think he’s got good stuff. However, his career record is slightly over .500 and he’s never had a breakout season. I know the Kansas City Royals want to compete, but you all could have seriously used your money in other places. I know desperation causes people to do stupid things, but when rational sense is lost I don’t know what to say anymore. *Gary Matthews. He hit the mother lode after one good season and one where he was well into his 30’s. Now, if you compare that one good season to his career numbers, then you kind of see why he’s been bounced from team to team. Well, we shall see if he can repeat his performance from ’06, but the numbers do not say so. Can we not be sure that AmeriQuest Field didn’t help to pad his numbers a little bit? *Barry Bonds. Even though he’s on the brink of breaking the homerun record, besides the drama, filling up seats and having Barry break the record in a Giant uniform, why pay him $16 million per year, much less at 42? I can name 10 players more productive than he who deliver for less. Think of this deal sort of as a severance package for when he goes away, the Giants needed him a much as he needed them. This man is like a bad itch and the press that will encompass him for his records, legal woes and misdeeds will take focus away of what the Giants will do on the field. *Juan Pierre. He’s fast, and just about it. He has a poor OBP, gets caught quite a bit in proportion to his steals and isn’t really that good of an outfielder. For 5 years and 9 million per year, the Los Angeles Dodgers could have found some one cheaper who could produce the same amount as Pierre, or even better. *Jason Marquis. Much like with Gil Meche, desperation does funny things. The Cubs signed a guy who was 14-16 with an ERA a wince above 6 for 3 years and 20 million dollars. I guess pitching is like the Playstation 3, you buy it on impulse thought, without any rational sense. He was so bad that the Cardinals didn’t even think to put him on their playoff roster! *Alfonso Soriano. This is one deal that does not look bad on paper, just that – he was signed for EIGHT years. By the time the contract has run its course, Soriano will be 39 and most players at the age do not play the same as they did in their prime. In year four or five, his production will most likely go down in comparison terms to his hefty paycheck and trust me; the Chicago Cubs will attempt to trade him in that time. He has great power and speed, but his OBP is not great and he strikes out too much. However, seeing him in the flesh in DC and Baltimore, he’s electric and will bring you a few years of value before the inevitable decline. *Adam Eaton. Big kid, lots of potential. However, the Phillies paid Adam Eaton like he is an above-average pitcher, although that’s not the case. He’s never thrown more than 200 innings and has been injured for the last two years. Pat Gillick is usually on point with deals; this was not one of them. *Carlos Lee. He’s got major power and does not strike out too much. Very Good. Now the bad, he’s 31 and has severe conditioning issues. He’s listed at 240 at a height of 6’4”. I am 6’4” and about 215-220 and there’s no way he’s 240, & I’d say 260 pushing 270. He’s signed for 6 years and if he doesn’t lose some weight, he’ll break and his numbers will go down with him. He’s worth maybe 10 or 11 million max, not the 17 plus Houston is going to shell out to him yearly. *J.D. Drew. The guy has decent numbers and a great OBP. The problem is that he’s oft-injured, seen as aloof and disinterested. I think much of his reputation may be due to the whole draft escapade with the Phillies, but the truth is that he’s been injured a lot and has had some issues with teams. If any of that happens in Boston, the media and fan base will up there take care of him. My whole thought about this deal was if they signed Drew for 5 years and 14 million, why could they not sign Damon for the same amount when their numbers are closely identical looking back at 2006. * Danys Baez: I am not one to ever rail on my Orioles, but signing Baez to the amount of money he will be receiving yearly is not worth it. I think the Orioles desperation is sort of the same reason why the Royals signed Gil Meche. Baez, a former closer with the Dodgers, Braves and Devil Rays had built up a solid reputation with some great numbers, and then started to regress around 2005. Considering how volatile relief pitching is, this deal could go either way. I though the BJ Ryan deal was asinine, but he was lights out with the Jays and the Orioles deep down inside regret not locking him up sooner. However, Baez’s overall number indicates he may slightly improve, stay at the same level, or get worse. For 6 million per year, he’s not worth it. Jack O'Connell of MLB.com has an article posted on the website that profiles Ripken and what many of his contemporaries think of his play, work ethic. Much of the article focuses on the "Streak" and the results of it. Cal's been getting a lot of love today, eh? 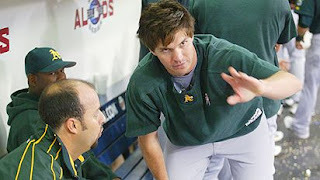 Cough, Cough - Barry Zito - 7 Years, 126 Million! I was just having lunch and I nearly choked on my sandwich. Well, Barry stayed at home, all right. He just jumped the pond in the Bay Area. Now we have two Barrys on one team - the Giants. He's not coming to the AL East, going to Texas or wherever else, and has chosen a city that fits his nature. The Giants agreed to a seven-year, $126 million deal with the lefty who was the last premier pitcher on the market. ESPN reports, "Sources told ESPN's Peter Gammons that the former A's pitcher has agreed to a seven-year contract from the Giants. The $126 million deal averages approximately $18 million per season. Zito will be formally introduced by the Giants this afternoon. The deal, agreed to late Wednesday night, includes an $18 million option for 2014 that could increase the value to $144 million, an unidentified source told The Associated Press. Zito is 102-63 in 222 career starts, including a 16-10 mark with a 3.83 ERA in 34 starts this year before becoming a free agent." Did the Giants pay too much? Yes. Is he worth the money? No. I'm shocked by the years and numbers! It's close to what Schmidt got, but the Dodgers were smart enough not to go that long term. "The contract -- the largest ever for a pitcher -- also includes an option for an eighth year that will vest if Zito throws 200 innings in the final year of the deal, 400 innings over the last two years or 600 innings over the last three." Well, Zito has had some fine numbers, but in my mind, you never sign a pitcher more than 4 years. Although Barry is still on the right side of 30, most pitchers will regress (well, except Roger Clemens, if you use that theory) and I don't know if signing Zito for 7 years is feisable. However, he's never been injured, so it may go either way, but then again, the law of averages my catch up to him. In the same article it was asserted Zito wanted to stay in the Bay Area, and he sure got his wish. The Giants now have a number 1 starter, and it's sure an impact move, especially after re-signing Barry Bonds. 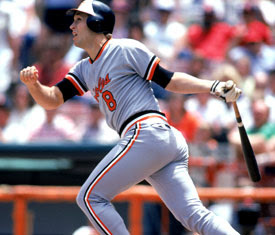 ESPN's own Tim Kurkjian has come out with another article on a another future Hall of Famer, this time, our own Cal Ripken. Once again, another great read and Tim gets down Ripken's accomplishments, what means to the game, and even more importantly, gets to the essence of what made Ripken so great and humanizes him. The article gets reflections from current & former players and those who knew and worked with Cal Ripken. A good portion goes into the influence, stories and makeup of his family, most especially his father and wife. A pleasant, fantastic piece for not only Oriole fans, but all baseball fans. "BALTIMORE - Wild hair, unshaven face and a ragged T-shirt collar peeking out underneath his jersey. With all the trade talk in the past week, Brian Roberts’ appearance Thursday didn’t come as a surprise. But Roberts, the Baltimore Orioles’ second baseman, was sporting his relaxed, offseason look — not a stressed-out appearance one would expect after reports this week had him destined for Atlanta in a trade. Roberts, who batted .286 with 36 stolen bases last season, was in Baltimore for the team’s annual Christmas party with 80 students from The Barclay School. His work in the community is likely one of the traits that led Orioles owner Peter Angelos to reportedly nix the trade for the popular lead-off man. He found out about the trade rumors via a text message from Orioles vice president Jim Duquette, whom Roberts said reassured him he wouldn’t be traded. Roberts, who is under Baltimore’s control until after the 2008 season, said the club has not yet approached him about a contract extension. Simply put, the man wants to stay here. He's a good second baseman, and good citizens are hard to find in the crazy world of sports today. Right now, I'm not sure what the organizational plan is, but if we want to rebuild for the future, we may want to trade him since he's a pretty valuable piece right now -- however, if we are build a team to compete, we should keep Brian. He's a fan favorite, a core of the team and a good representative of the team and citizen. Why has this guy not been signed to an extension already? USA Today has an article posed on their website about the Baltimore Orioles and where they stand for 2007. The article takes a comprehsive look at the Orioles by analyzing the influence of Leo Mazzone on the pitching staff, signings, a fairly quick review of the season and roster. It's a quick read and will help you get caught up with what's been going on the offseason and expectations for 2007. 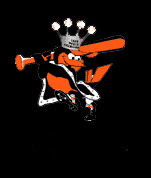 Tony Pente of the great Orioles site, orioleshangout.com was on ESPN Radio 1300 and MASN's the Anita Marks Show yesterday afternoon in the 5 o'clock hour giving his run down of what's happening in the the Orioles' minor league system, major league team and the state of the fans here in Baltimore. He's very articulate, well-versed on the Orioles and knows his stuff. It was great listening to his thoughts, and his opinions and analysis echo my and many of the fans' sentiments. Rather than try to regurgitate everything he mentioned, I'm just going to link to a transcript of the chat. The Yankees finalized their $20 million, five-year contract with Japanese pitcher Kei Igawa, making him a member of the team officially. The Yankees paid $26 million for the rights to negotiate a contract with him. Angels outfielder Juan Rivera had surgery Wednesday to repair the left leg he broke playing winter ball in Venezuela last week. No timetable is set on his return to the Angels, but he's set to start rehab in 6 to 8 weeks. The Rockies signed reliever Danny Graves to a minor-league contract. Alex Cintron agreed Wednesday on a one-year, $1.9-million contract with the White Sox and avoided arbitration. According to the NY Daily News, Former Yankees star Bobby Murcer was set to have surgery Thursday to remove a brain tumor. Get well, Bobby. Evening everyone! I was about to head out to the gym and then blow some extra Christmas money and a Target gift card, I am going to post a non-baseball related item, but on a topic that will probably never go away as long as there are multi-million dollar contracts, agents, and the pursuit of glory and winning. The issue of the steroids & ethics in sports. Today's focus: Shaun Merriman. I don't like criticizing athletes, especially ones from my alma mater, the University of Maryland, but I must because someone has to. Reading ESPN.com this evening, I read this article just now from the AP (Associated Press). Apparantly, Jason Taylor, a defensive end for the Miami Dolphins is not happy that Shaun Merriman, another defensive end got chosen over he to be in the Pro Bowl. In the middle of the season, Merriman served a 4 game suspension for being caught under the NFL's substance abuse policy, and got busted for a tainted supplement. "You really shouldn't be able to fail a test like that and play in this league, to begin with," Taylor said Wednesday. "To make the Pro Bowl and all the other awards, I think you're walking a fine line of sending the wrong message." Merriman, who plays outside linebacker for the San Diego Chargers, has denied he's a steroid cheat and blamed his positive test on a tainted supplement. "A performance-enhancing drug is, obviously, what it is," Taylor said. "You enhance your performance by doing that. You fail that test, I think it's not right. It's against the rules and ultimately I think it's sending the wrong message to the youth in America and the people who look at this game not only as entertainment but also to learn lessons from it." I don't like to play the role of the moral advocate, but in this case I will. Although being chosen for the NFL Pro Bowl is a honor and I'm sure Merriman will benefit financially, Taylor is right. With the millions at stake with contracts, endorsements and in a place as cuthroat as the NFL, there needs to be valor in performance and when a player is caught cheating, they have destroyed the integrity of a sport. I really don't care about multimillionaires, or a fringe athlete who want to put their future at stake for a trophy and more money, or some recreational gym rat or bodybuilder who wants to look better, but it instills a "cheat to win" mentality and tricks those who are impressionable - kids and teens. Most that use performance enhancing drugs know that it will get you ahead no matter what the consequences may be 10, 15, 20 years down the road. However, most don't know what to when athletic or legal ramifications that may come about if they were ever exposed to be doing them. The reality is that performance enhancing drugs do work, and people, no matter education or class will take a shortcut to win or get ahead. Rules are the rules, and Merriman broke them, no matter if he was responsible or not. In fact, I believe a man with his resources should know what he puts into his body at all times. In the end, I sometimes feel this whole drug debate doesn't matter. MLB broke attendance records in spite of the talk and received record revenue, the NFL is just as profitable as ever, and we all still pay top dollar for a ticket and will go to ends of the earth for an autograph. Performance matters, and we all heap praise on the person who hits the most homers, hits the hardest and runs the fastest. Do we honestly care if they use drugs or not? Take a look at Jason Giambi? Everything with him has turned back to normal, as he got booed, struggled and then started to perform again? Does it matter he was lumped in with the BALCO investigation? In the end, even though cheats are exposed, and with the exception of athletes like Floyd Landis and Justin Gatlin, does anyone really get punished and pay for it dearly - I don't mean suspended or shamed in the media, but in terms of their lifestyle? Do athletes lose their money? Do owners of sports teams, and corporate sponsors stop and become moral? To be honest, does it really matter and will sports ever be clean? In the end, we honor and in a lot of instances reward bad behavior in all areas of our society, so does it matter that someone got caught using drugs? The article takes a look at the expansion of MASN, the Mid Atlantic Sports Network owned by the Baltimore Orioles and Peter Angelos and their plans for 2007. Much of the piece takes a look at Peter Angelos' influence, the finanicals of the network, plans for airing the Baltimore Orioles and Washington Nationals, the integration of ESPN TripleX radio & plans to create a viable regional sports network. As well, Denlinger's article also looks at how MASN wants to avoid mistakes of other RSN's (regional sports networks') and make the network a focal point in Mid-Atlantic sports. A good read for those interested in MASN, baseball coverage next year and their business model. The interest, innuendo and speculation is about to warm up with the steroid issue with MLB again. According the AP, the names and urine samples of about 100 Major League Baseball players who tested positive in 2003 can be used by federal investigators for evidence, and that in turn may have implications for Barry Bonds who's had various legal issues over the years. The Pandora's Box that was slightly opened is going to be opened wide open in a bit, and the problem of drugs in baseball will be shown to have been substantial. Most of us are interested in the names that will come out, and it's only a matter of time before they are leaked. Most of the players who are seen to have a positive test will probably never have to face punishment, but the court of public opinion will take care of that. According to the St. Louis Dispatch, "The Minnesota Twins are thse apparent leaders to sign righthanded pitcher Sidney Ponson, signed by the Cardinals last season and then released to re-sign with the Yankees. His grievance hearing for being dismissed by the Orioles in 2005 has still not been heard, and has not yet been rescheduled." Of course, if you remember Sidney Ponson was jettisoned from the Orioles after a drunk driving incident in 2005. In 2006, he pitched for the Cardinals and Yankees, subsequently released from both teams due to poor performance. He's expected to be a 5th starter or be part of the bullpen. "The Cubs are reviewing Cliff Floyd's medical records one last time before finalizing a one year, incentive base contract. A deal is most likely to be finalized this weekend. Floyd batted .244 with 11 HR and 44 RBI. 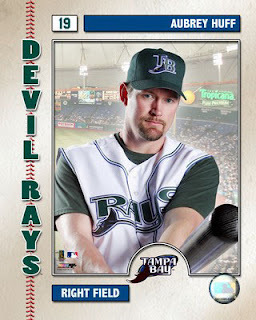 He will most likely platoon with Matt Murton in left field." Guess he's off the O's list. O's News: Roch Kutbako mentions in his blog: "The Orioles remain in talks with the representatives for Craig Wilson and Aubrey Huff, but it doesn't appear that anything is imminent. It should be fairly quiet this week. It usually is between Christmas and Jan. 1. But phone calls are being made each day." I personally think we need to sign one or both of them. Right now, with the exception of Chris Gomez, the bench looks weak and fairly think. Getting these two would add two solid veterans to the team and both could get significant time in a platoon situation. Aubrey Huff is the sexier name and perhaps with the best bat, but Craig Wilson is serviceable and from seeing him in Pittsburgh and the Yankees, has a decent bat. Both may not be known for their glove, but they are better options than what we have at the moment. Great article on ESPN.com by Maryland's own Tim Kurkjian's on Tony Gwynn. It's a foregone conclusion that he'll be inducted into the Hall of Fame with Cal Ripken. I called the Baltimore Orioles this morning because as a season ticket holder (which I am), you were supposed to get a Christmas card with some complimentary tickets to the event which I have not recieved. My good friend who is a season ticket holder recieved his tickets and promotion for the event, so I decided to give the Baltimore Orioles' office a call. According to the Baltimore Sun's Roch Kubatko, the event is to be held on Sunday, January 14th. However, there's a reason why there has not been any advance promotion or any mention of it on the website. The reason is that since the Baltimore Ravens have secured a playoff spot, a playoff home game on the date of the Orioles' Fanfest could (let's say would) adversely affect attendance. In the conversation I had with the representative for the Orioles on the phone, the date may be not be set in stone and possibly could change depending on the Ravens' playoff run. Perhaps not promoting the FanFest may have been the smart thing to do right now, but still wouldn't some promotion might be warranted? Well, this is a baseball blog, but this is not a baseball post. 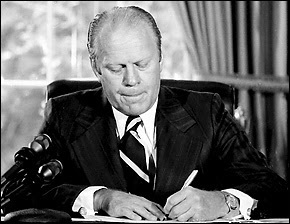 However, no matter your political affiliation, let's take a minute to honor the 38th president of the United States, Gerald Ford who died today in California at 93. He was the only president not elected to the presidency or vice presidency, as he took office in the aftermath of Watergate and was his most notable act was that he issued a full pardon to former president Richard M. Nixon. 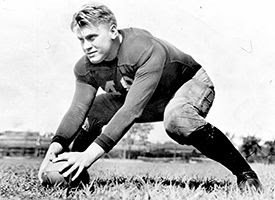 In light of his work as president, he was quite the athlete before his life in public service as he played on Michigan's 1932 and '33 national championship football teams. He was actually offered at one time a contract to play for the Detroit Lions. He passed at the chance to play football and went onto law school at Yale. It was the right choice indeed, and for that Mr. Ford, we thank you for your public service and devotion to the country. *Thanks to ESPN and the Washington Post for the compliation of facts and info for this posting. The Orioles.com have their Orioles Season in Review article titled, "Youthful Birds Make Strides", now on the website that chronicles the 2006 season and the moves that were made in the offseason. According to ESPN.com, first baseman Shea Hillenbrand agreed to join the Los Angeles Angels on Tuesday. "If they can pull off the blockbuster trade they're talking about, the New York Yankees could replace one star left-hander with another. Randy Johnson is available, and the Yankees have begun trade talks with the Arizona Diamondbacks, San Diego Padres and possibly the San Francisco Giants, and if they are able to deal Johnson, the Yankees could jump in as a surprise late entrant in the Barry Zito sweepstakes." The baseball season has been over for a little over two months now. Since the St. Louis Cardinals took home the trophy, rumors, talk and transactions that have taken place during baseball’s idle time has made this another season upon itself in the game. So alas, we need to need to discuss that state of the Baltimore Orioles in my eyes. We are about halfway through the offseason, and since pitchers and catchers report to camp in February, now is a good time as any to discuss the Birds. It has nevertheless been an interesting off season, not only for the Orioles, but for all of baseball. First off, we remade our bullpen, which was sort of an Achilles heel throughout the 2006 season. Second, and most glaring, we tried to get an impact bat and failed because of the market and the front office’s hesitation to bid on the extravagant contracts the marquee free agents wanted. Third, we tried to get a frontline starter, but did not for the same reasons we didn’t get an impact bat – money. Let’s start with the bullpen. With the exception of Chris Ray and Chris Britton, the bullpen was a continuous audition for a bad play that resembled a train wreck, with guys from Triple-A being called up, reclamation projects such as Jim Brower, John Halama and Russ Ortiz pitching; as well, giving failed starting pitchers like Rodrigo Lopez and Bruce Chen an opportunity to fix their problems, but more often than not, failing. Well, when failure is the result, you have to rebuild and retool. That’s what the Orioles did with the bullpen. If you’ve been keeping score at home, the only pitcher secured a spot right now in the bullpen is Chris Ray, and he’s the closer. The Orioles signed pitchers Scott Willamson, Danys Baez, Jamie Walker and Chad Bradford. With the free agent market being the way it is right now, the team signed good pitchers with reliable track records. That’s the good news. The bad news may be the amount we paid for them. All in all, nearly 42 million dollars was spent securing relief pitching, which I found to be an astronomical number consider how volatile it can be. The best signing was Scott Williamson, as he received a one year deal for $1 million and he’s trying to recover from an injury and this perhaps may serve as a tryout. The rest of the pitchers, most especially Baez, were signed for too many years. Danys Baez has established himself as a reliable closer in MLB, as of late for the Dodgers, Braves, and the Devil Rays, but had a down year in 2006 and he’ll be doing setup work for The Birds. Jamie Walker is known as a left handed specialist and came from the AL Champions, Detroit, but I think in the end, he got too many years at an average of 3 million plus. Chad Bradford may be the most reasonable of the group, as he had a great year with the Mets and is a submarine/sidearm pitcher who’s had past success. Well, the next area I’d like to focus on is the starting pitching. In my opinion, this is the place which will determine whether the Orioles will sink and swim, considering the expectation of the young pitchers in the rotation. The rotation right now has a lot of upside, but not necessarily the expectation of anything great. The ace of the staff, Erik Bedard came off a great year where he led the club in wins and ERA, and this will be the season to see if he can take it to the next level. He became the leader of the rotation and excelled after he learned a changed and used it in his arsenal. In my mind, he might be the only sure thing assuming he doesn’t regress. The two wild cards in the rotation and that will make or break the Orioles are Adam Loewen and Daniel Cabrera. They both have great stuff, Cabrera especially, and both have youth and time on their side. Adam Loewen last year showed signs of brilliance, especially against the Yankees, but also showed his inexperience by sometimes losing focus and showing bouts of wildness, and not hitting his spots when pitching. I expect him to improve as he has more games under his belt. Daniel Cabrera could be the next big thing or a pitcher who was unable to reach his potential. A towering presence, Daniel has a great fastball and great stuff, but he was way too inconsistent, wild and sometimes like confidence in his ability. Sometimes his mechanics were off, but it is more of a mental thing and not knowing to or having the confidence to battle out of tough spots. After his final start with the Yankees, the world got to see what he could and hopefully it will serve as motivation for him to get to the next level. The two last pitchers slotted to start in the rotation are Kris Benson and Jaret Wright. Both men are pretty much seen as average starters and middle to end of the rotation guys. Benson has always been known as an average pitcher who will give you a .500 record and about a 4.50 or above ERA. Jaret Wright, who was with the Yankees, & came over from a trade for relief pitcher Chris Britton. Wright is probably a 5 or 6 inning pitcher at this point in his career and has had average numbers. He’s also battled a number of injuries too and is a long way from the pitcher he was in Cleveland and Atlanta. The saving grace for the pitching staff is if Leo Mazzone can in year two spark the magic in the Orioles that he did in Atlanta. He’s pumped to be ready for camp, and this year will determine whether his reputation for working wonders with pitchers is real for just because of the talent he was able to secure in Atlanta. My opinion, the bullpen has improved, but has the starting pitching? Like I said earlier, the pitching is the wild card and will determine whether the O’s will sink or swim. Not having Ortiz, Chen, perhaps Lopez will improve things by a lot, but the pitchers still need to perform to their ability. The final portion of this post deals with the offense and fielding. With the exception of Jay Payton, the lineup is almost identical to last year. During the offseason, we had a chance to sign Alfonso Soriano, Carlos Lee and a group of lesser name sluggers, but we only acquired Jay Payton. I figure this was primarily due to the amount of money and the contracts that many players wanted, even though it may not have been indicative of their ability or track record. Jay Payton is a fine player, but he’s not the bat the Orioles needed. The priority for the Orioles this offseason was to get a big bat, and one to protect Miguel Tejada. That has not been done of yet, and as of right now, the biggest slugger on the market is Aubrey Huff and it is unknown if we can acquire him. The Orioles were in the bottom half of runs scored and did little to improve upon that. Although he’s probably past his prime, resigning Millar was beneficial, as he’s got an good OBP, plate discipline and is good in the clubhouse. Although his numbers last year were subpar, when he’s given a chance to play, he is productive. The middle of the field is secure for now with Brian Roberts, Tejada and Melvin Mora. Brian Roberts came back from a gruesome injury, and Tejada once again delivered with the bat, but his power numbers were slightly down. However, his fielding looked suspect last season and I sorely hope it was because of injury, and not because of age, because his range and performance were poor in the field. Perhaps a position change might do him good, either to first or third, but it looks like he’s in the field for now. Melvin Mora had an off year and his numbers look to be declining, but you can count on him to bat .280 with at least 15 homers and 80 RBIs. All three guys are fan favorites, and will probably be here for a number of years to come. Even though the trade values of Miguel and Brian are fairly high, do not count a on a move to happen. The outfield is manned by Jay Payton, Corey Patterson and Mark Markakis. Nick broke out in a big way this year after struggling in the first part of the year. After June, he came out blazing with an almost .400 average and was hot throughout the summer as he finally got comfortable at the plate and secured the everyday position in right field. However, he regressed in September and perhaps it was due to fatigue, but nevertheless he’s the bright spot on this team. I expect Markakis to break out this year, bat close to .300 throughout the year and cross the 20 homer plateau. The other two men in the outfield, Jay Payton and Corey Patterson are serviceable enough for now. Payton has a lot of miles on him, as he played for the Mets, Rockies, A’s and Red Sox, but he’s always been reliable and should give you solid numbers. Corey Patterson is a speed demon and great in the field, but he strikes out way too much and doesn’t do particularly well against lefties. We also have Gibbons who may be slotted to be the designated hitter or first baseman. He’s battled injuries for a while now, but with his build and power, he should be at least hitting 25 homeruns with over 90 RBIs. The main question is can he stay healthy? He’s only 29, still has time on his side and maybe being out of the field will keep him intact for a whole season. Right now, I am not sure who we will have on the bench, with the exception of Chris Gomez who was nothing short of great once he came back from his injury, and Brandon Fahey. In the end, the Orioles need to decide whether they want to compete or rebuild. On paper, they look slightly better than what their 70-92 record indicates, but in my eyes, it looked like a lot of the players were not trying and accepted the way things were. However, I think we are quite a bit away from contending, but if all goes well a .500 record is attainable. There needs to be a plan with the organization, whether to rebuild around Tejada, and get the bats we need, or perhaps consider trading our strongest chips, outside Bedard, Cabrera, Markakis and Loewen and see if we can get young talent under our control to compete perhaps in ’09 or ’10. If competing and contending ever becomes palatable again here in Baltimore for the Orioles, there are more changes to be needed with the makeup of this team. The thoughts for this article got sparked by a fellow blogger, Aaron Brazell at Suicidefan.com about the Rumors of Cal Ripken possibly having the ownership of the Baltimore Orioles transferred from Peter Angelos. That podcast got me thinking again about the protest this year at Camden Yards. On September the 21st of this year, the protest was an unprecedented event in the history of Baltimore sports. The numbers vary, but anywhere from 1,000 to about 2,000 fans left their seats, walked the lower bowl and left the Oriole Park at Camden Yards to the amazement of the remaining fans in the park and the national media. The protest was enacted and spear-headed by Nestor Aparicio, proprietor of WNST, a radio station in the Baltimore area, and nephew to Orioles’ and White Sox legendary infielder, Luis Aparicio. Well, because I live outside of the immediate Baltimore area, I cannot get the station, so I found out about the event through a friend of mine who I often see at games. To be quite honest, I was not familiar with Nestor Aparicio, much less his network. Basically, the whole thing started with a petition on the radio’s website, then the whole thing grew and spread through the radio and word of mouth. The premise of the protest was for the fans to walk out at 5:08pm, 5 o’clock, the hour in honor of Orioles third baseman who wore number 5, Brooks Robinson and the :08 for Cal Ripken who wore the number 8. At first, I was very skeptical about this protest, and thought it was a self-serving on part of Nestor and just a way to amp up ratings for his radio network. However, after looking at his website and parts of his story online, he, no doubt had a passion for the Orioles and Baltimore sports in general. That being said, I can only give him respect and the guts to have pulled of this task and gotten the attention of the media. I have been to Camden Yards several hundred times since it's opening and sadly it is a far different world than what it was in it's heyday in the 90's. I long for the street to be buzzing and fans dominating with the Black and Orange again. Whatever Nestor's motive was, the good things is least he got the plight of all of us Oriole fans out there in the public domain. So out of curiosity, I went to the game that day. I had tickets with a friend of mine behind home plate and I planned to take an afternoon off work and soak in the events. From where we sat, we could hear the fans chanting various things and to my delight I heard chants of “Let’s Go O’s”, and old-time Orioles such as Elrod Hendricks, Cal Ripken, Brooks Robinson and former announcer John Miller. The fans who were part of the protest sat in the upper deck in left field. For a few moments, you saw lively fans and enthusasism that almost harked back to the days of Oriole Magic and Wild Bill Hagy leading the Orioles chant. The angst of the fans in the upper deck was heard as chants of “Sell the Team”, “Free the Birds”, “Pete Must Go” and various things were heard. The crowd up there was no doubt lively and boisterous in comparison to fans in the lower deck (which incidentally was probably one third to 40% Detroit Tiger fans). Soon enough that day at 5:08, the fans left the upper deck and that area was soon rendered quiet. However, the show didn’t end and it soon spread the lower deck. A multitude of fans soon walked the lower corridor of the park and were flanked by cops, as well as watched by ushers and Orioles officials. The crowd that day was not large at all, as I’d say it was less than 10,000 people, but the group of fans who protested made their point expressed – loud and clear. 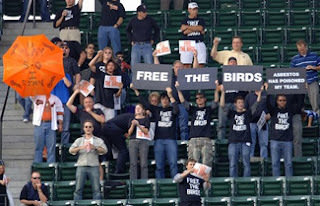 For about a period of 20 to 30 minutes, you saw an endless line of people in black mostly, shouting “Free the Birds”, “Sell the Team”, and held signs up with those same messages. In my eyes, it was inspiring and those fans held the same sentiments that many fans had kept to themselves. In the end, Nestor got his mission accomplished. I thought this all blow over and just be a snippet on the news. However, the protest was covered in almost some fashion in every major sporting news outlet nationally and in all the papers in the Mid-Atlantic region. It even made ESPN's SportsCenter and a few of the radio shows, but mostly mocking the protest. However, the protest did do it's intended purpose. It didn't get the team sold, but Nestor and the result of it struck the cord of Peter Angelos. I figured Mr. Angelos would just ignore the event and just let it pass, but Peter reacted. While he may or may not be right, wins and losses and the team's reputation matter to people and the fan base here is not happy. In the end, Nestor did get under his skin and his work in the end did get the city to talk about the team, how the Orioles got to this point and where the team could improve. In light of the rumors of Cal and investment group possibly buying the team, will Peter sell anytime soon? Probably not. I will say though, the anger of the fans towards the ineptitude and incompetence of the Orioles is growing, so any public showing our displeasure is a big step to letting the front office know our feelings. Maybe something down the road will happen for the team to improve and perhaps close the talent disparity between us and the Red Sox and Orioles. In essence, the protest echoed what the fans want, a winning team, or just one that’s competitive. After 9 years of losing, mired in fourth place and being criticized throughout baseball, that day was a symbol that fans want a change for the better and perhaps want the team in the hands of someone who cares and could possibly restore the team to the glory days of the 60’s, 70’s and early 80’s. The protest sure let those feelings be known, and in the end, nothing much might have changed, but for a few days after that game, the events of that day were indeed the talk of Baltimore and the sports world. Quick Hits: Big Unit out of NYC? "In the past week the Arizona Diamondbacks have offered a package of players to the New York Yankees in exchange for Randy Johnson, a baseball official said. In need of starting pitching -- and a marquee name that will draw more fans -- the Diamondbacks have offered a package of at least three players, including a major-leaguer. They would also want a 72-hour window to negotiate an extension with Johnson, who is owed $16 million in the final year of his contract. The Yankees, according to the official, don't want to pick up any of Johnson's salary." Wow. If this is true, then this would be big for both teams. The Yankees will rid themselves of Johnson's monstrous contract, a player who has not quite fit in the Big Apple, and a pitcher who has not matched his success in Arizona with the Yankees. In turn, the Yankees would get some prospects, some major league ready and also they could exercise more flexibility with their pitching staff and possibly set themselves up in the race to get Roger Clemens. The D-Backs will get a marquee name, and a guy familiar with the area. Also, the move could possibly make the team a contender again in the NL West. If Johnson could possibly regain his form with Arizona again from his first tour of duty, the combination of he and ace Brandon Webb would be a formidable twosome. However, Johnson must approve any trade, as he's got a no-trade clause in his contract. Hey all, just want to wish you all Happy Holidays! Anyhow, I have a selection of baseball photos from 2006, and it focuses a little more on stars actions from other teams, not necessarily from the Orioles. Let me know what you think of the photos by either leaving me a comment or shoot me an email at mdguy2415@aol.com. Just click on the logo to access the pictures! 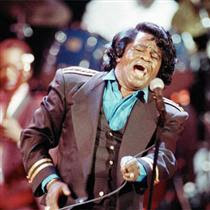 Mr. Brown, though you lived a rich and full life though rife with trials and tribulations, however, your contributions to music and entertainment will live forever. I was lucky to see him once in New York City while I was in college, and it was one of the better, and most electrifying live music shows I have been seen. Thanks for sharing a gift from God and the passion to your craft to the world. Ok, my mother knows I am a baseball fan and adore the Baltimore Orioles, and her extent of baseball knowledge does not go farther than that. She got me cologne. 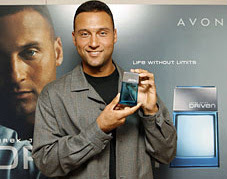 She got me ... Derek Jeter's Driven Cologne! Upon opening the gift, it was an internal reaction I never had before. I looked and looked and told my mom thanks, but she didn't understand that my X-mas will be a downer now. Being an O's fan, especially after '96, this goes further than getting the bad sweater or hard fruitcake. This to me is bad, yes, it's only liquid and chemicals, and my mother didn't know what it represents, but it was tough accepting the gift. It's out of love and my mother was being thoughtful and Jeter is a good guy, but it's what the gift represents -- the New York Yankees! However, I got some courage and opened the box which stored the cologne. I sprayed it and took a whiff, and actually is not that bad. 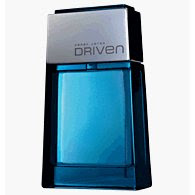 It has a masculine tint to it, as the smell isn't too strong and perhaps serves just right. Hey all, just want to wish you all Happy Holidays! 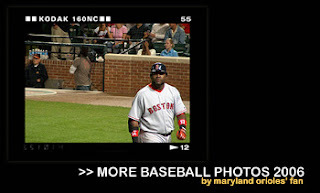 Anyhow, I have a selection of baseball photos from 2006, and it ranges from shots I took at Orioles' games, as well as some trips I took and the 2006 All-Star Game in Pittsburgh, Pa. Let me know what you think of the photos by either leaving me a comment or shoot me an email at mdguy2415@aol.com. Just click on the logo to access the pictures! 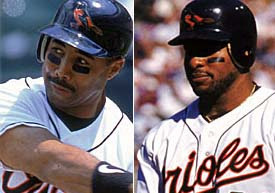 I just reading up on Orioles.com today and saw two articles posted on whether Harold Baines or Albert Belle are legitimate candidates for the Hall of Fame. Well, let's consider Harold Baines first. He always seen as a quiet, focused, but steady and consistent. 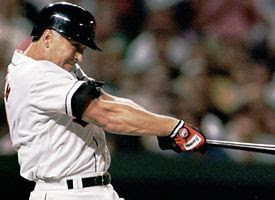 He's a local guy from across the Bay Bridge and although he came up short of 3,000 hits (he had 2,866 career hits), he played 22 years for the White Sox, A's, Rangers, Orioles and Indians. Baines finished with a .289 average, 384 home runs, 488 doubles, 1,299 runs scored, 1,062 walks against just 1,441 strikeouts and 2,830 games played. Should he get in: Yes. His numbers are very solid, and even though he came short of 3,000 hits, he played for winning teams and he was the epitome of professional. He may have to wait a few rounds to get in, but he will get in eventually, I think. Now, let's go to Albert Belle. A menacing, intimidating figure to opposing pitchers, the media and some fans, he was a heck of a ballplayer and a prolific homerun hitter. Belle spoke with his bat and he was an integral part of Cleveland's success of the 1990's. Albert Belle retired early because of a condition of his hip while with the Orioles, but he played 12 years and hit 381 home runs in that period. However, for all his success, his temper and incidents on and off the field have perhaps soiled his contributions on the field and perhaps his chance at the Hall of Fame. Should he get in: As much as I find him to be a sociopath and loathe his incidents, it's the Hall of Fame, not the Hall of Morals. His number are incredible for someone who played as long as he did and he does not have the longevity factor on his side to have accumulated the lofty numbers of some of his peers. Based on the numbers, he should get in, but people have long memories, and his behavior off the field will serve as that. He may not get in while the writers and media have control, but perhaps with the Players' Committee. The Brewers have signed former Cardinal and NLCS Most Valuable Player Jeff Suppan to a four-year deal with the Milwaukee Brewers on Sunday for $42 milliom. It's an ok move, and maybe if everything falls into place for the Brewers (like Ben Sheets healthy for a season), this addition might make them a contender. There's an option for a 5th year. Zito is still chillin' - He has not signed with anyone as of yet. The Rangers may or may not be of the Zito bidding considering the trade last week with the White Sox. Well, our neighbors to the South, the Washington Nationals, have made incredible progress on the construction of their ballpark. It's incredible what's happened of late down there and it looks to be that the Nationals should be able to complete the project on time, considering the mountain they had to climb. I like baseball in general, and I often consider the Nationals as the second team I follow. I have been to quite a few games in Washington and hope the team does will in the future, and I will be keeping track of their stadium progress. Orioles' Fan Fest: Why no Promotion? Hello to all out there & hope you are enjoying Christmas Eve considering the unseasonably warn weather we are having in the DC/Baltimore area. Anyhow, does anyone out there even know when Orioles' Fan Fest is? Anyone at all? Well, using the means at my disposal, primarily my laptop and a little patience, I went on Google and entered in "Orioles Fan Fest 2007". Well, on the first page of the search term entries, I did find a reference to Fan Fest 2007. The lasting for it was the fifth link down, as the first link referred to previous years Orioles' Fan Fest! And the kicker is, the lifting was not even on the Orioles' web site or any sites affiliated with it, but on a site called "Mendy's Baseball Memorabilia". The second mention of Fan Fest on that page is the last entry and it directs to the Baltimore Covention Center asking staff what needs to be ordered! The only other place I found a mention of the event was on Orioles Hangout, only because there was a thread devoted it. Within that thread, one poster said that season ticket holders (at least those who paid their invoice off) were only notified about it. I appreciate those particular sites for letting us know about Orioles Fan Fest 2007, but my first question is why the Orioles are not promoting it. Let's go to the Orioles.com website. 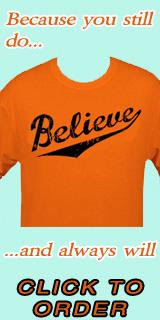 Link: http://orioles.com. Do you see any mention of FanFest? No. Neither do I. Why I am searching on Google for it when I should be able to find it on the team's website? Are they holding it this year? The Baltimore Orioles will conduct their annual Orioles FanFest on January 14, 2007, at the Baltimore Convention Center from 10 am to 6 pm. This is an all-day celebration of Baltimore baseball that will include the participation of several players and coaches. Assorted Orioles players will sign autographs and pose for photos at the Baltimore Convention Center. There will also be baseball clinics, exhibits and interactive games during the celebration. We are going on less than 3 weeks until the event, but yet nothing has been said officially from the Orioles, either in an advertisement, on the web, on the radio and even in a press release. Do they want to no one to come, or is there a hold-up? What if the Ravens play a game that Sunday (which they probably may) in the playoffs? If someone can tell me why there has been no promotion for this event, please let me know. Heck, if someone from the front office or promotions could let me know, that would be better. I would like to go, take pictures and perhaps my little brother to meet his favorite players. If nothing is announced, I probably still might go, or I may not and have other plans. What about fans and families, especially those with little kids? I love this team as much as anyone, but sometimes stuff like this makes it hard to be a fan especially in these lean years. From CNNSi.com: "According to one source, the Orioles initially flinched at Aubrey Huff's asking price; however, it has come down significantly, and one industry source believes Huff is now looking for a three-year deal worth around $23 million. Huff also has attracted interest from the Indians, Rangers and Pirates; the Yankees and Red Sox could be interested on a one-year basis.-- Baltimore Sun"
Check out the article on orioles.com about Brian Roberts and his thoughts on the holiday season. The article is just a Q&A about on how Brian will spend Christmas and his reflections on holidays' past with his family. I Could Not Resist: My Views on "Rocky Balboa"
Chris Ray a Brave? LaRoche an Oriole?